In 2005, The New Press published Say It Plain, the celebrated companion to the American RadioWorks® American Public Media documentary chronicling the great tradition of African American political speech of the past century. In “full-throated public oratory, the kind that can stir the soul” (Minneapolis Star Tribune), Say It Plain collected and transcribed speeches by some of the twentieth century’s leading African American cultural, literary, and political figures. Many of the speeches were never before available in printed form. Following the success of that pathbreaking volume, Say It Loud adds new depth to the oral and audio history of the modern struggle for racial equality and civil rights—focusing directly on the pivotal questions black America grappled with during the past four decades of resistance. 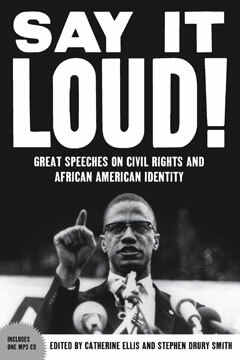 With recordings unearthed from libraries and sound archives, and made widely available here for the first time, Say It Loud includes powerful speeches by Malcolm X, Angela Davis, Martin Luther King Jr., James Cone, Toni Morrison, Colin Powell, and many others.